Yes, those are scrapes and bruises on the cute little guy's face. It seems he always has some sort of bruise or scrape these days. 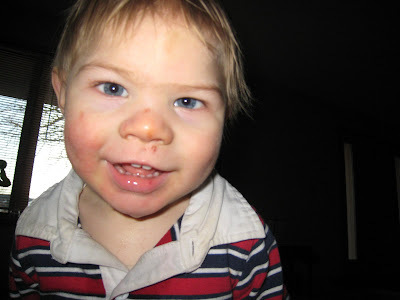 This time he fell walking up the neighbors driveway and scraped his face and nose. He cried for a moment and then wanted to be put down so that he could walk some more. Such a goofball. Our little man is developing such a little personality. He's always had his own personality, but it's shining through more. I love it. Happy Twenty Months little man. You're growing up too fast! Hi! HAPPY 20 MONTHS, Elijah, you big boy, you! Yes, you can just see his personality shining through in those photos. Lisa, can't view the video, for some reason, maybe it's my computer? Thanks Ellen. Nope, totally not your computer. Andy fixed the problem for me, so it should work now. :) It totally pays to marry a guy who works on computers for a living. It is so nice to see Elijah doing so well.